Surplus Polish MC-1 Gas Mask w/ Filter and Camo Bag | BUDK.com - Knives & Swords At The Lowest Prices! 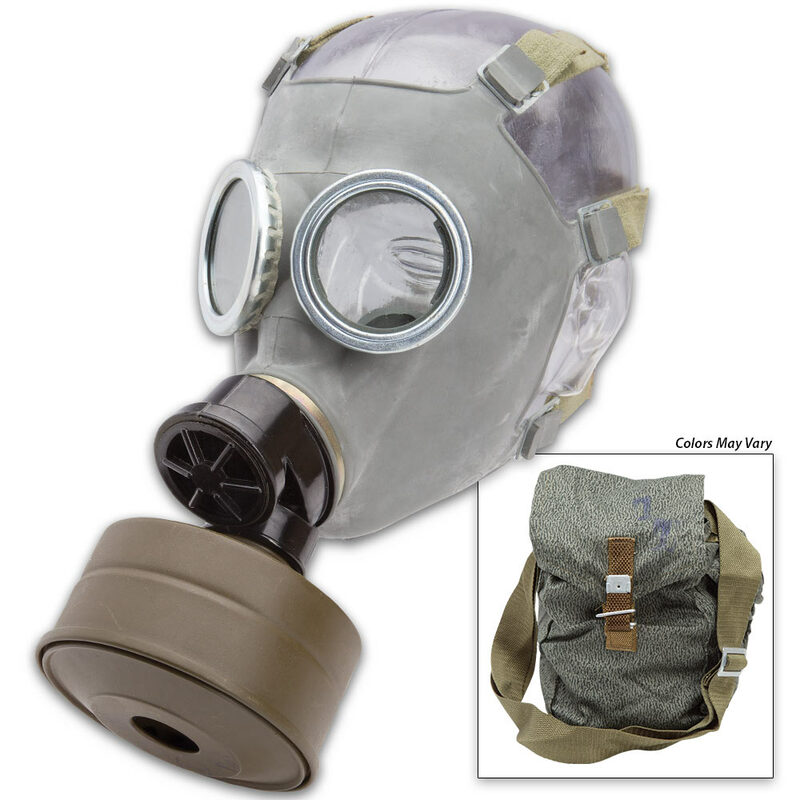 The Polish MC-1 Gas Mask is the genuine article - an authentic piece of Polish military surplus equipment. Perfect for your military gear collection, soldier costume or even a reliable, inexpensive personal protection solution, we’ve got these effective and downright cool-looking masks at the lowest price you’ll find anywhere. In addition to the mask, you get an authentic camo carry bag and 40mm gas filter - the very same set issued to Polish land forces. And if it’s good enough for soldiers in a warzone it’s got to be good enough to you, no matter what dangers come your way! Poland’s military originally developed the MC-1 to protect troops from nuclear, biological, chemical and radiation threats. 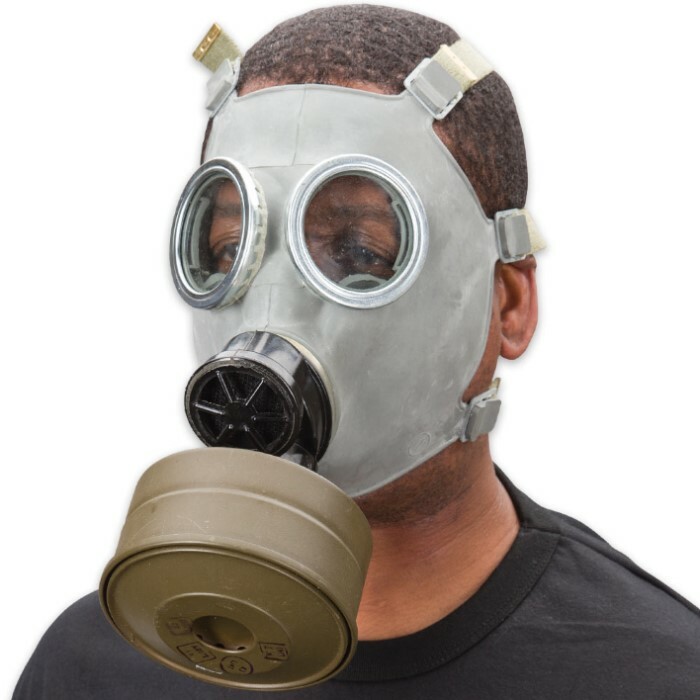 It features design elements from Czech and Israeli standard gas masks and uses NATO standard 40mm filters. With its six-point adjustable head strap, pliable rubber construction and speech diaphragm, the MC-1 afforded Polish soldiers superior protection and surprising comfort. Recognizing gas masks’ tendency to impair soldiers’ visibility, Polish military engineers gave the MC-1 oversized round eyepieces that provided perhaps the best field-of-vision among gas masks in any military at the time of use. Like Polish soldiers, you never know when you might need protection from chemical, biological, or radiological dangers. Likewise, you can’t know where you’ll be when it happens. Thus, it’s smart to stock up - multiple masks for multiple locations. With our unbeatable prices, it’s easy! Don’t wait for disaster to strike; start today and be ready, come what may! Kind of ugly, but usable. The mask I received was significantly weathered and dirty upon arrival. The rings surrounding the glass eye pieces are rusty and scratched.. and the eye pieces themselves were covered in dust and dirt. After cleaning it up, however, it doesn't look too bad.. but it has a small leak, so it wont do much for protection. If you like to collect gas masks I recommend this one, but it wont do much for saving your life.